What is a Circle Supper? These are informal pot luck dinners for members and friends of the UUCK. The meal provides an ideal setting for an intimate gathering to share food and conversation. These are all about creating connections in our community – new members and long term members and visitors. What does the host do, besides provide the space? The host coordinates the meal with the assigned guests. This includes issuing an invitation (usually by e-mail), setting a start time and determining how to handle the pot luck, whether assigned dishes or open choice for sharing. The host decides what part of the meal to provide. Many provide the beverage and /or a main dish. Members, friends, people visiting or exploring the church. Circle Suppers are generally for adults, although hosts and guests may work out other arrangements. How do I know who will be at the Circle Supper? Sign-up sheets allow you to see the names of others who have signed up, however, when numbers allow, tables will be assigned with an eye to changing up the mix of guests. Ideally you will be sharing a meal with at least one person that you have never really talked to before. 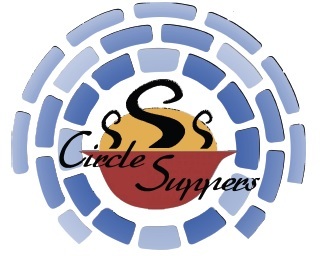 Why is the Membership Committee coordinating Circle Suppers? We have had some feedback from new members that it can be difficult to establish a sense of belonging, of becoming a part of our congregation. Circle Suppers are a low key and fun way for us all to get to know one another as we continue to grow and welcome new members. Sign up now with the Sign-up Genius at: http://goo.gl/PP6Mai or you can sign-up on the Circle Supper sign-up sheets in Fessenden Hall and at the Visitor’s Table in the Founder’s Lounge.